In these times we used to talk about every kind of art expression as performative acts: for visual arts and also for music. Like all performing art, also music introduces itself as a theatrical experience, an all encompassing and communal experience – the involvement of spectators for first, feelings, the emotional power from the rituals surrounding these shows, the experience. In this cultural landscape, in our times, two things seems in opposition, but they don’t: on the one hand, the introduction and the diffusion of new technologies creates open space to experimental form, sort of mash up between music, video and interactive systems ( it results from the tradition of the experimental music from 1970, with personality as Philip Glass, Laurie Anderson, Meredith Monk, Steve Reich, Robert Wilson, Peter Gabriel, Brian Eno and many more), even introducing AI (artificial intelligence) or VR (virtual reality), the simple streaming vision of a live show, and also more relevant implications for music business. On the other hand, economic crisis put every musicians in the necessity of embracing new ways of sharing, creating and selling music. This necessity often is a translation of a new kind of diy (“do it yourself” practice) for musicians, producers, promoters, helped by digital technology: this is not valid only for live events (different places from the institutional ones, as record store, Blutopia  in Rome for example, or clubs, different tour management or self-promotion with the use of social media and video sharing) but also for single musicians, emerging bands or labels and associations. As a matter of fact, we need to consider also some changes of values and trends created by the digital evolution of the scene: this is a deal but also an opportunity that keep in movement and in searching all the music landscape and its audience too. 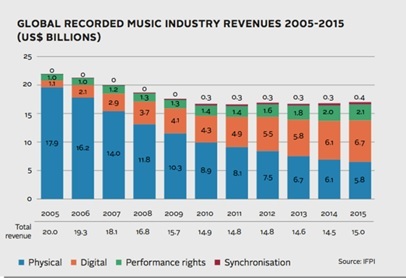 The infographic shows the increase of digital and performance rights revenues from 2005 to 2015 in music industry to the detriment of physical performances. About this topic, we can mention a large number of music performances that used to experiment with new form of digital experience and different ways of communication with other musicians or with audience, who often became part of the same performance: for example, Aphex Twin in 2011 with “Remote Orchestra” directed a big orchestra and a chorus in remote control, or the work “Fly to paradise” in 2013, composed by many singers from 101 places around the world to create a big virtual chorus in a global dimension; “Rolling in the beats” by Itacha Audio, a sort of video mash-up made mixing sounds from several youtube users; or the huge project “Opera by you” invented by Savonlinna Opera Festival and a group of finnish artists that consist in a big work “Free will” in 2012, created by too many composers, writers, actors, musicians, professional or not, posting their contribution on the web site Wreckamovie  . Also in music copyrighting and performance rights, the digital era helps to create new spaces and new opportunities for both actors of the game, for independent musicians and producers and for who wants manage the music: one for all, we can mention as an emerging reality Soundreef , an independent management unit, founded in 2011 in London by two young Italian guys, Davide D’Atri and Francesco Danieli and then also in Italy in 2015, which represents a clever alternative to SIAE in matter of copyright, making easier royalties, a good option for young musician who begin the long way to success. In these last months, during the most famous italian singer’s competition (Sanremo) there was a lot of rumor about Soundreef , something like a legal battle with SIAE. For who is interest to expound upon the argument, web is full of articles about it. One of the most important things to say is that today it’s easier to self-manage and spread music project or band, helped by youtube and social media, soundcloud, streaming radio: a lesson that many musicians and labels and also clubs seems to know well. This is an open willing for every one: but it’s not always true that more music lovers you reach with your name, more coverage you’ll receive. Many music projects or bands work not just through large diffusion, through a mass of audience, but more for a restricted audience of that specifical genre, a particular kind of music or movement, also for independent and “diy” musicians. This create a range of different cultures that enrich our music landscape, a turmoil of instruments and practices from underground places to istitutional ones. Also in Italy, in this moment, there are a lot of bands, musicians, labels, coming from independent scene, who are very interesting. They’re working hard with self-management. We can try here a tracking shot of personalities who can be good new proposal, in different music genres, to discover and to follow. In the territory of the big mix of experiences that compose post-rock genre, one of the band who stands out in the last period is Fuzz Orchestra, a project that “mixes heavy rock sounds with a fluxus of analog noises and a narrative layer build up by voice samples borowed from old movies and documentaries”  : they’ve started with this band in 2006, but just with records in 2012 and in 2016. They reached a large number of people, working always in the independent scene, where they were able to create their niche of audience. From post-rock with many different influences also the Stashraiders  : young musicians from that mix up rock and pop sounds with psychedelic and garage, they call it “Apocalyptipop”, in a full coloured performance of high level. From a mingle of garage, rock and punk also the interesting band Female Trouble Band  “desperate queer rock’n’roll”, founded by Elisa Abela ( who play also with Joe Lally and with Primati), they are influenced by rock of ‘50s, Elvis, Chuck Berry, Bo Diddley and vocals from female groups of ‘60s.Fresh and funny, bandbackers.com defined them as “Grace Kelly with messy make up after wild night”. One man band and one man show, totally self-produced and self-managed: The Blues against youth  , “country rock primitive one man experiment” brings his music all over the european area ( above all Italy, France, Germany, Holland). Gianni Tbay plays all instruments (guitar, voice, bassdrum, hi-hat, whistle and the “invisible iron snare) simultaneously. the Bluesbunny.com wrotes about it “The Blue Against Youth’s raison d’être is to distil the essence of the past into something once more pure and while the sound might well be dirty, the concept is as pure as the driven snow all the way through these twelve tracks”. Gipsy Rufina  , a full time touring musician: a life travelling with his guitar on shoulder across Europe and South America, constantly toured from 2005, an authentic hobo rambling on the streets of folk and blues and playing original acoustic ballads. From streets of Bologna to Chicago and Japan, also the rising band Ofeliadorme  , new wave with a touch of electronic, a whole italian project that live of tender and seductive vibes, a sort of “crossroad between Cocteau Twins, Portishead and Pj Harvey”. Always from Emilia Romagna it’s important to mention the duo Comaneci , between folk and post-rock, with the seraphic voice of Francesca Amati and the sophisticated sound of Glauco Salvo, and one other explosive duo of young guys from Finale Emilia, born in 2010, Francesco Molinari e Daniele Maini, MOOD  , an all instrumental power duo with a fresh and heavy math-rock sound that do their best on stage. This two young guys come from the talent’s forgue of the drummer teacher Federico Alberghini and the G.C.Andreoli’s foundation of Finale Emilia, one of the town that lives the nightmare of earthquake in Emilia Romagna in 2012: the same forgue who give the chanche to a great and important project about music and humanity, Banda Rulli Frulli  , a huge percussions band of hundreds children and teenagers, an experiment about collective and social power of making music that goes beyond music research. In the town of Latina, near Rome, a young promising star is Mascia Timpone  , singer and songwriter with a soft and fresh voice, psychedelic pop and dreaming folk ballads smelling of elegance. Flavio Scutti  between ambient, electronic landscape and sometimes folk. A many-sided talent: musician, producer and video-maker, interested to all the digital world of audio and video, since 1995 he’s leading researches about new and experimental audio-visual languages, through the study of electronic systems. One other personality from the same kind, Andrea Noce  is fascinating and noteworthy: she’s a singer and producer, polynstrumentist and visual artist living in Berlin. She focused on the visualization of sound, the new interfaces for musical expression and the shift of visual concerts from the audiovisual to the interactive dimension, and she has many different music projects that goes from pop to electronic through techno and disco, as “Andrea & Alexander”, “Eva Geist”, “Arcane Onde”. Very interesting in this electronic landscape are also band and project in Rome as Nastro  , between electro, new wave, lo fi and noise and Cascao & Lady Maru  , a pop punk electronic and new wave duo. Electronic vibes too, full of energy and techno roots, Produkkt  : he’s Fabio Sisti, young artist who live in Rome making music also with several cool collaborations, with other artists (Cyberpunkers, Vitalic), and for a movie “The legend of Kaspar Hauser” directed by Davide Manuli. Particularly new and curious is the trend in Rome but also in other city of Italy ( an example is the festival in Venice “Andata e ritorno”, or “Poesia Carnosa” in Rome) about projects which mix up poetry and electronic music: one for all Acchiappashpirt  , a sonorous poetry project duo that came to life in 2008 with an Italo-Albanian soul. Mapo Magazine (Albania) wrote about them: “Poetry pilots the electronic sound through wirings and feedbacks and so turns it into poetry itself. Their concept is inspired by the ouija board, which is oral communication as a path to paranormal activities that passes through the linguistic Babel, used to free the sense”. They are Stefano Di Trapani, musician, writer, music critic, producer and performer, and the beautiful and talented poetess Jonida Prifti both with many other project about different kind of sound researches ( for him, Trapcoustic, System Hardware Abnormal; for her, Opa Opa!, Shesh). In this project, the research on music, noise, goes in parallel with the one on languages, the performance they do is like a battleground between these two codes. At last, it’s important to mention also some of those labels who spread and bet on a kind of music that is not mainstream: Fooltribe  from 1996 ( founded by a musician, Tiziano Sgarbi alias Bob Corn), or the younger Selva Elettrica  ( born in 2005 as an open music archive about noise), Upupa Produzioni  ( the MOOD’s label),No sense of place records , La Tempesta . We can’t forget magazines as Mojo4Music, Noisey , Rumore , Mucchio Selvaggio . From paper to web, their value is to keep open the discussion on music, in a dynamic way, promoting and reviewing genres, projects and personalities. In conclusion, after this list of suggestions about the alternative music landscape “made in Italy”, we can say that even if today technology and digital instruments are already able to replace musicians ( for example the startup Jukedeck, based in London, that uses an algorithms to create songs  ), a sort of bid to escape the royalties policy which can represent a loss for many artists, the same instruments can’t replace the musician’s personality, his energy on stage during the live, the genuine research that there is behind a music project. The musician explores and discovers new kind of solutions or just his personal solution, for a code, a language, a genre, for his audience. This attitude can use technology and digital tools as real instruments, not as surrogate machines, and it’s the spontaneous trend that moves any kind of art expression, from music to visual art. The genuine calling to music research about a genre’s niche can be a good transmit of culture, can feature the audience going in parallel to intentions of big data’s technology. If digital’s password is profiling the perfect audience, also the act of carrying out inclinations, influences, music tastes are each valid instruments to create, in the same time, a good field of followers and a precious music proposal in this extended culture’s horizon. What will remain of the Days ?